I love the idea of making delicious dishes spending more time in my kitchen but there are days when I want to wrap up without the hassle of the prep that is involved before cooking for most of the dishes. Today was such a day. I came down home with sambhar in my mind but ended up making this utterly tasty delicacy of Andhra that is usually served at weddings or a family gathering along with mudda pappu. 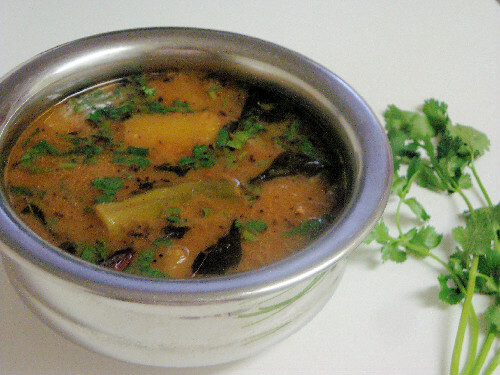 It is called Mukkala pulusu/Dappalam/Theeyati Pulusu which is a crossover of rasam and sambhar. Vegetables cooked with tamarind extract, jaggery/sugar and finished off with tempering gives an amazing taste. I love the sweet and sour taste of the cooked veggies in this dish. Here is a quick and easy way to make it using a pressure cooker. For those of you who do not have a pressure cooker, use the stove top for boiling the vegetables. In a pressure cooker/heavy bottomed vessel, add all the cut vegetables, along with green chillies, salt and turmeric powder. Add tamarind extract water and Pressure cook the veggies for 2 to 3 whistles or till fork tender if cooking on a stove top. Let the pressure go off then remove the lid. Add jaggery/sugar, sambhar powder, spice powder as mentioned above, chilli powder, and gently mix. Add 2 more cups of water. Cook for about 3 – 5 mts on medium low flame. Check for salt, and sweetness at this point of time. While it cooks, heat ghee in a skillet/pan, on low flame add urad dal and fry till light brown in color. Add mustard seeds and jeera. Let them splutter. Then throw in the dried red chillies, curry leaves and asafoetida. Toss in for few seconds then turn off the flame. Add the tempering/popu to the vegetables in the pressure cooker/vessel, mix gently and cook for 2 more minutes. Turn off the flame and garnish with freshly chopped coriander leaves, cover and leave it for 10 mts before serving. Serve hot with steamed rice and mudda pappu accompanied with papad or a stir fry of your choice. wow it looks very delicious & tempting soujanya … will try this sure in the coming week ….. Very nice one… tried it and it was awesome (actually I realized that my Mom gave me EXACTLY the same recipe) Thanks and keep up the good work. Thanks so much for trying the recipe and letting me know. I’m glad to hear from you.